According to the International Labour Organization (ILO), more than 2.3 million workers die every year as a result of occupational accidents or work-related diseases. To put this number in perspective, across the world 167,000 people died in armed conflicts in 2015, according to the latest edition of the IISS Armed Conflict Survey. In addition to this astounding number, each year 313 million accidents occur on the job resulting in extended absences from work. The ILO estimates that the annual cost to the global economy from accidents and work-related diseases alone is a staggering $3 trillion. Moreover, a recent report suggests the world’s 3.2 billion workers are increasingly unwell, with the vast majority facing significant economic insecurity: 77% work in part-time, temporary, “vulnerable” or unpaid jobs. 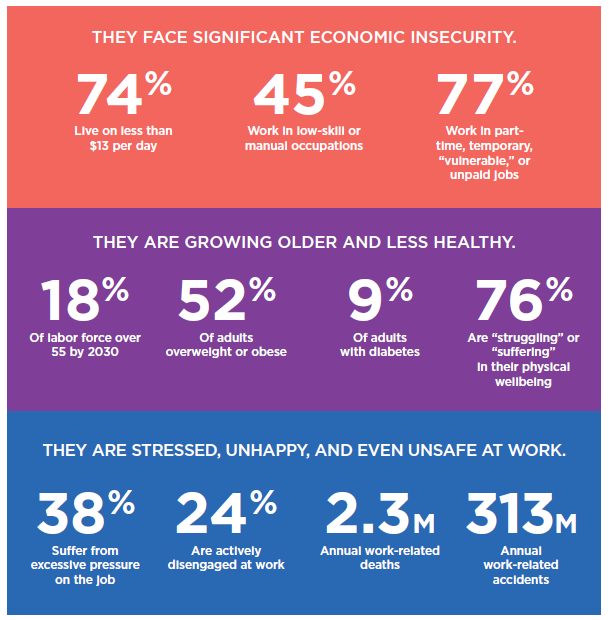 What’s more, the labour force is growing older and less healthy: 52% is overweight or obese and 38% suffer from excessive pressure on the job. 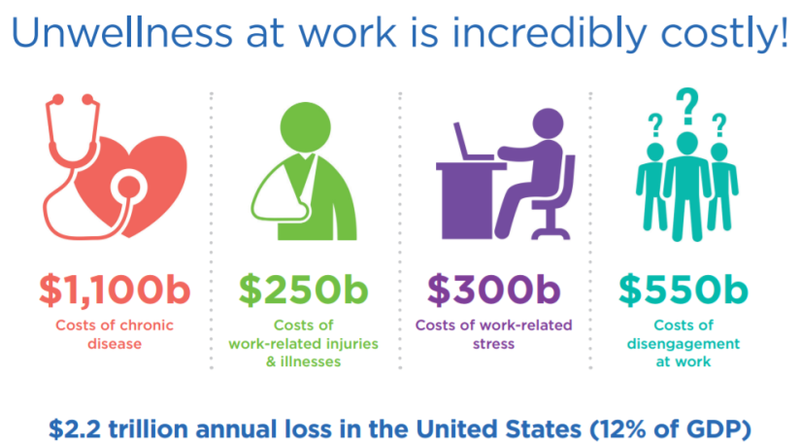 In addition to the social and human costs of health problems and fatalities, the cumulative economic burden caused by a lack of wellness at work is enormous for both businesses and the global economy. This is especially true when productivity losses are added to direct medical expenses. A lack of wellness in the labour force is estimated to cost the global economy between 10 to 15% of global GDP. In the US alone, work-related injuries, illnesses and stress, and workers’ disengagement are estimated to cost the economy more than $2.2 trillion a year. The causes of safety and health problems vary by sector. In the urban economy, for example, approximately one in six fatal workplace accidents reported globally takes place in the construction sector. This is mainly because of the intrinsically hazardous nature of this work, the challenging locations of construction sites, changing work environments and high rates of staff turnover. There are also health problems associated with building activities, such as musculoskeletal disorders and exposure to hazardous substances, such as asbestos. The construction industry has, however, come a long way in preventing accidents and health problems. Within the industrial construction environment, both contractors and owners have to commit the time, budget and management to focus on the well-being of the construction workforce. Contractors are not only obliged to provide statistical proof of acceptable safety performance, but also programmes and processes that promote the safety of every worker in their care. This prerequisite for a safety culture has allowed the industry to change from injury management to injury prevention and the creation of “zero incidents” goals. Ultimately an organization’s culture should ensure that its workers go home safe and healthy, while also satisfied from a good day’s work and proud of what they have achieved. To assure physical well-being, there can only be a zero-tolerance approach with respect to occupational health and safety issues. The key is to set the right example: an organization’s leadership has to demonstrate that no single job is worth a loss of life, injury or disease. They have to place key values – such as empathy, respect and ethical communication – at the centre of the organization, while creating an environment of trust and integrity, perhaps via a clear, effective and enforced code of conduct. It is important to establish a governance and engagement protocol, with open collaboration between employer and workers to discuss and address problems, and proactively channel grievances. By asking workers to engage in steering committees, action teams and observation teams, they will not only identify and prevent hazards, but will generate a feeling of a protective organization. To ensure the well-being of an organization’s labour force, it is paramount to address the social security challenges presented by an ageing society, as well as the emerging consequences of digital and technological progress, in a sustainable way. Innovative approaches that promote inclusive growth, reduce income inequality, introduce alternative social security models (basic income, for example) will ensure that future employment will contribute substantially to the well-being of humanity. While there are many possible implications of new technology for labour, with respect to safety and health it is possible to anticipate a number of opportunities. Advanced technologies could indeed increase worker wellness by removing work hazards and easing physical exertion. In the context of elderly workers, these technologies could include a so-called “super-strength operator”, where a human being wears a powered, flexible and mobile exoskeleton. Other examples of human-machine interfaces are: augmented and virtual operators; healthy operators, such as wearable health sensors and trackers; smart operators connected to intelligent personal assistants (IPA); collaborative operators, who train and work with collaborative robots; social operators, who tap into a business's online networking services; as well as analytical operators, who use big data analytics. As these advances in technology continue, there are already innovations that can be applied today, allowing workers to not only remove or protect themselves from hazardous circumstances, but also to potentially become more efficient. All construction industries have the opportunity to advance the use of technology and, as a result, make workforce engagement safer. There is a mutual reinforcement between professional development, on the one side; and safety and health, on the other. First, it is important that safety and health is included as an integral part of training schemes throughout professional careers. At the same time, improved safety and health will help companies attract talent. Therefore, to attract the best talent with the right skill set, a healthy work environment combined with a wellness culture becomes increasingly important. We often underestimate the importance of psychological and emotional health in the workplace. Mental and emotional well-being is essential to overall health: positive mental health allows people to realize their full potential, cope with the stresses of life, work productively and make meaningful contributions to their communities. The employer can proactively contribute by providing the necessary work-life balance, creating an empathetic organizational culture, offering stress-reduction programmes, implementing anti-harassment policies and supporting family leave, among many other things. While the above suggestions encompass a wide and important sets of policies, they do not claim to be exhaustive. A holistic approach is recommended, to capture the entire OSH system, integrating its stakeholders.